Located in Eastern Pushkar, Hotel Prem Villas offers a 24-hour front desk and outdoor pool. Boasting natural surroundings, the hotel provides free parking. 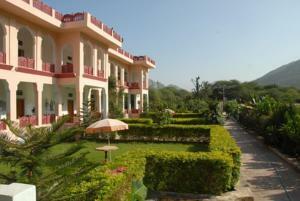 Hotel Prem Villas is 11 km from Ajmer Railway Station. Sanganer Airport in Jaipur is 146 km away. Rooms are fitted with a TV, telephone and tea/coffee-making facilities. Both air conditioning and a fan are provided. Each room comes with a seating area. The hotel arranges for cultural programmes and puppet shows upon request. Ticketing and car rental services are available. Laundry can be done. Athithi Devo Bhavh restaurant serves a selection of Indian, Chinese and European dishes. Food from the Rajasthani region is also featured. Wi-fi is available in public areas and costs INR 100 per 24 hours. Free! All children under 10 years stay free of charge when using existing beds. One older child or adult is charged INR 300 per night and person in an extra bed. There is no capacity for extra beds/cots in the room. Supplements will not be calculated automatically in the total costs and have to be paid separately in the hotel.